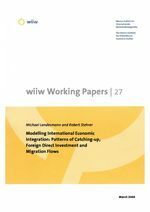 This paper develops a Schumpeterian model of international specialization and catching-up. In a previous version of the model we looked at the impact on international trade specialization when different patterns of technological catching-up are followed. One of these is a Gerschenkron pattern at the industrial level, where the largest initial gaps in productivity give rise to the fastest relative productivity growth rates. Depending on the productivity, wage and profits dynamic there can be 'comparative advantage switchovers' in which a catching-up economy turns its competitive advantage towards medium- to high-tech areas. In this paper we follow up the impact of the unit profit or 'rent' patterns on foreign direct investment and through that on the speed of technology transfer and hence on differential productivity growth. We show that labour market dynamics, productivity catching-up and investment patterns all combine to determine the evolution of the international division of labour. We point also to the impact on labour demand and wage structures (between skilled and unskilled workers) both in the lead and the catching-up economies. The model thus contributes to the literature on globalization and labour markets.